X Bar is Siem Reap’s premier rooftop bar and live music venue, located on the corner of Sivatha Blvd and Soksan Road. 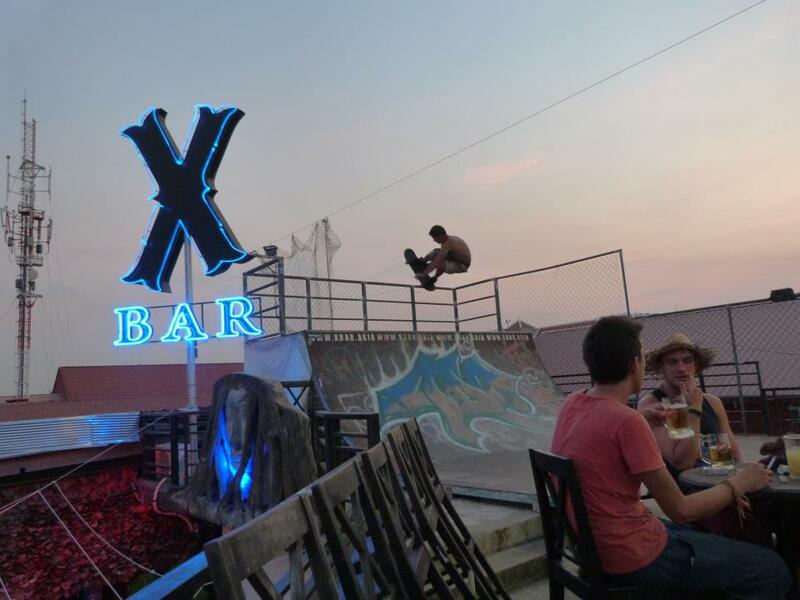 The bar is unique in Cambodia with a 6ft half-pipe on the top floor (skateboard to rent). The bar has a stage for live music, pool tables, foosball tables and a big screen broadcasting movies and sports events. X Bar probably has the best views in the city and is open until sunrise. How many bars have you been to that have a half-pipe on the roof? Probably none, unless you’ve already been to X Bar in Siem Reap. I’m not a skater, but it was cool that they had a half-pipe on the roof, and it added another level to the bar, offering a great view of Pub Street. The music was good and there was plenty of space to dance around. They also had pool tables and foosball, the staff was friendly, the drinks were reasonably priced, and at least one of the girls made killer mojitos.